Can a Heater Hurt Your Indoor Air Quality? | Sound Heating & Air Conditioning Inc.
« Do You Need a Whole-Home Humidifier? Can a Heater Hurt Your Indoor Air Quality? With some cold temperatures ahead before the official start of spring brings warmer weather, we’re still using our home heating systems on a pretty regular basis. Some homeowners try to use theirs less and less this time of the year, even if they’re cold, because they think it hurts their indoor air quality. There’s a misconception that heaters hurt indoor air quality by drying out the air. Dry air is certainly bothersome, but please don’t stop using your heater! Instead, look into the right indoor air quality systems in Tacoma, WA. Modern construction has made our homes tightly sealed up against the elements. This is great for your HVAC efficiency, but it can impact indoor air quality in a negative way, such as allowing allergens and other contaminants to get trapped inside. The answer to this is looking into an air filtration or air purification system. But more on that dry air. Dry air is a problem in not only does it make you uncomfortable, but it can affect your health as well. More on that below! Humid air retains heat better than dry air can. This is why during the summer, it feels so muggy outside (and inside). This is especially true after a good rainstorm. The cooler air of the winter season doesn’t maintain humidity well, which is why the air can end up feeling really dry, and we feel really dry. While it may seem like a minor problem to have, humidifying your home with a whole-house humidifier will actually benefit your home and your health. And you don’t ever have to stop using your heater, until temperatures warm. Is Dry Air Bad for You? Air that’s too dry—that is, air that has a relative humidity level anywhere under 30%–leads to the drying out of everything it is exposed to. This includes you. You may experience chapped lips, flaky and itchy skin, frequent coughing and sore throats, and even illness due to dried-out mucous membranes. That’s not the end of it, either. 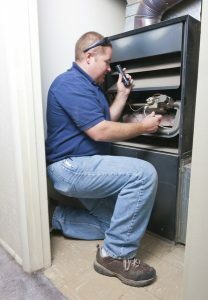 There are a number of household problems that can accumulate due to the presence of dry air. Splitting wooden floorboards, cracks in wooden furniture, damage to electronics due to static shock, chipping paint, and splitting wall paper can all occur in your home. A whole-house humidifier is beneficial to your home in the same way an HVAC system is. It makes you more comfortable, and healthier! You could get a portable system, but this simply won’t be as effective. Whole-house humidifiers tackle the problem throughout your entire home, and can be easily integrated right into your HVAC system. Remember, indoor air quality is about more than just how hot or cold you are in your home. Comfort comes in many forms, from your HVAC system, to your humidifier and/or dehumidifier, or even a high-efficiency air filtration system. Contact Sound Heating and Air Conditioning Inc. today! We take your comfort as serious as you do.